Hoxe tráiovos unha receita catalana típica da cuaresma. Aínda que na Galiza tamén acostumamos a facer chuliñas, o certo é que a preparación destes bunyols é ben diferente, e é por iso polo que deixo o nome en catalá, para que non haxa confusión coas nosas chulas. A receita é, coma sempre, sinxela e rápida, e non quedan nada aceitosos. E os ingredientes son deses que sempre temos pola casa, polo que é unha receita moi socorrida para cando queremos facer unha sobremesa sen ter que mercar moitos ingredientes diferentes. Imos aló! 1. Poñemos a manteiga, a auga e o azucre no lume ata que se mesture todo ben, mais sen que chegue a ferver. 2. Apartamos a pota do lume e engadimos a fariña e o fermento, todo dunha vez. 3. Volvemos a poñer a masa ao lume e deixamos que coza un chisco máis ata que se despegue ben das paredes da pota. 4. Poñemos a masa nun bol e engadimos os ovos 1 a 1, mesturando todo moi ben. Paciencia, que tardan en integrarse. 5. E a continuación engadimos a culleradiña de anís e a reladura de limón. 6. Formamos os bunyols con dúas culleriñas, para ir facéndolles forma redonda e fritímolas en abundante aceite quente (non ten que estar excesivamente quente porque se teñen que facer ben por dentro, a lume medio) ata que estean ben douradiños polos dous lados. 7. Cando xa estean a punto, rebozámolos en moito azucre e listo! A lista de ingredientes non é pequena, mais xa vedes que son ingredientes ben doados de atopar. Para acompañar, o mellor é unha cunca de chocolatiño quente, sobre todo para estes días fríos que veñen 🙂 Eu escollín anís e limón para darlle sabor, a vainilla ou a reladura de laranxa tamén lle quedan moi ben. Probade e xa sabedes, que se os facedes, sempre podedes enviar as vosas fotografías a kukinhas@kukinhas.com ou por facebook, twitter ou instagram. 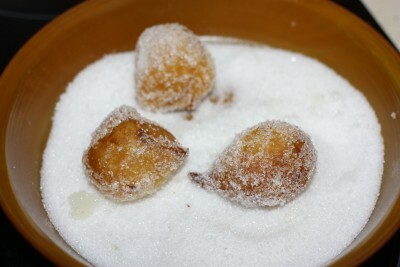 Today’s recipe is a typical recipe in Catalonia during the Lent season. 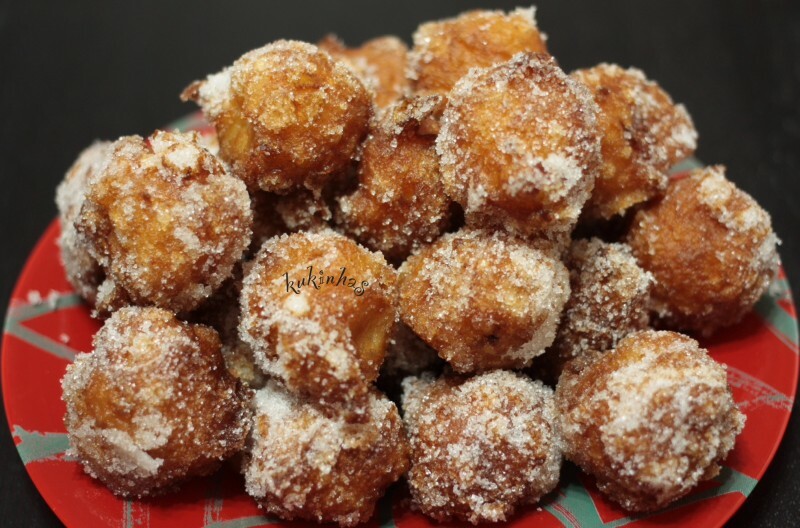 Although in Galiza we also prepare some kind of bunyols – we call them chulas – this recipe is a different one, and that’s why I will use the Catalan name insted of the translation. This recipe is very quick and simple, and the ingredients we need are those we usually have around in the kitchen, and so we can prepare it anytime we feel like having something sweet. Let’s go! 1. 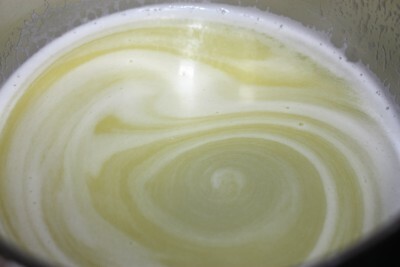 Cook butter, water and sugar in a pot until all well integrated, but without letting it boil. 2. Take it out from heat, and add flour and baking powder, all at once. 3. 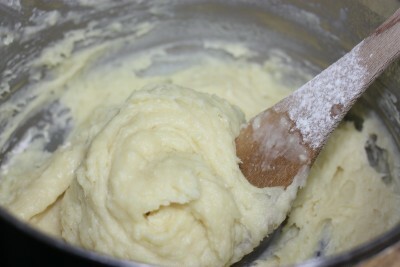 Cook it again at a low heat until dough does not stick to the pot. 4. 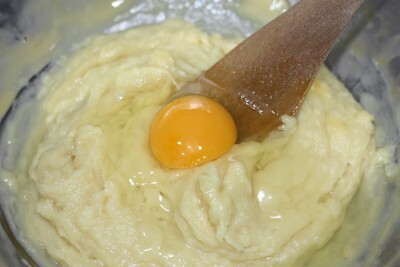 Put the dough in a bowl and add eggs 1 by 1, mixing well. Be patient, egg and dough take time to integrate well. 5. Then, add anise and lemon zest. 6. 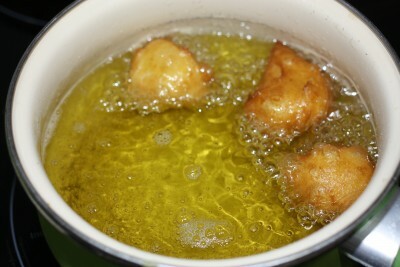 Form bunyols with two teaspoons, giving them a round shape and deep fry them in plenty of hot oil (not very hot, at a medium heat, so dough is completely cooked, even in the inside) until bright brown on both sides. 7. When they are ready, coat them in lots of sugar and that’s it! The ingredients list is a little bit long, but don’t panic, they’re all easy to find in any supermarket. And to totally round up such a delicious dessert, the best option is a big cup of hot chocolate, specially during these cold days. 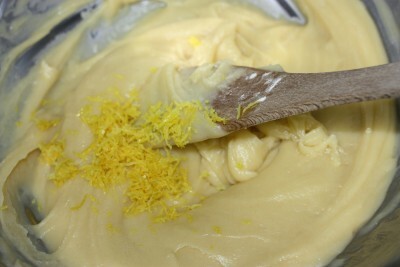 I’ve tried anise and lemon to give it flavour, but you can either use vanilla or orange zest as well. I hop you try and make them because you’re gonna love them! And if you try and feel like sendind a pic, you can send it to kukinhas@kukinhas.com, facebook, twitter or instagram.